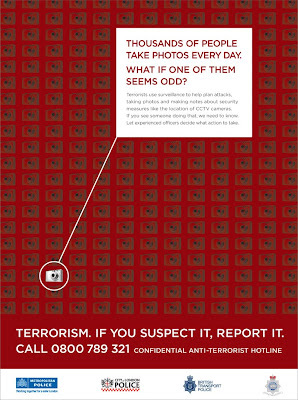 The latest Met Police Anti Terrorism Campaign has me really worried. If you are taking photographs, have too many mobile phones blah blah blah, then people are encouraged to report you to the police……to let them investigate. Whilst I appreciate that there are those that are up to no good, it seems a little excessive and in fact seems to create suspicion rather than deal with the problems at hand. The pic on the right is one of the posters/newspaper ads…..I am going on record……THIS IS NOT GOOD! ← nearly a year already……..